An organization called Bridget was planning to host an event for high school girls and young women. I didn’t really know what exactly the event was all about, but it had something to do with female empowerment, so I eagerly applied. After attending a couple of Bridget events and speaking with the organization’s founders, I have learned a lot about this promising new initiative. "Our long-term goal has always been gender equity through empowerment. Eventually, we’d like to see the workplace gap close, the pay gap close, the gender discrepancies to even out. We’d like our girls to continue to feel empowered, to say, ‘Anywhere I want to be, is where I belong. Any dream I have is attainable’," says the Bridget team. The summer event was held at one of the beautiful Microsoft office locations in Playa Vista on July 6th and 7th of 2018. The environment fostered creativity, innovation, and collaboration, all of which were important themes of the event. On the agenda for the day, there were multiple “Breakout” sessions in which guest speakers would present on a relevant topic and foster an open discussion. Actress Daniella Monet hosted a session on “Finding your Authentic Voice on Social Media and Beyond,” while Steven Xu exposed us to the future of virtual reality (VR) by allowing us to sample some awesome video games made with the latest VR technology and software. The event also focused on building real-world skills, such as networking. For example, we created our own LinkedIn accounts and learned how to successfully navigate the platform. Bridget executes their mission of making more career pathways accessible for women by equipping young girls with the skills they need to succeed in whatever route they choose in life. “I think that the biggest skill a young woman can develop is communication of her interests and articulation of how she can add value," says Asha Lannin, the founder and CEO of Bridget. At the start of this school year, I received another email from the Bridget team notifying me that their next event would be held on November 1st at USC. The event was called “Speak Up Girls: Using Your Voice When it Matters Most.” It started out with a meditation, followed by discussions on the topic of speaking up. 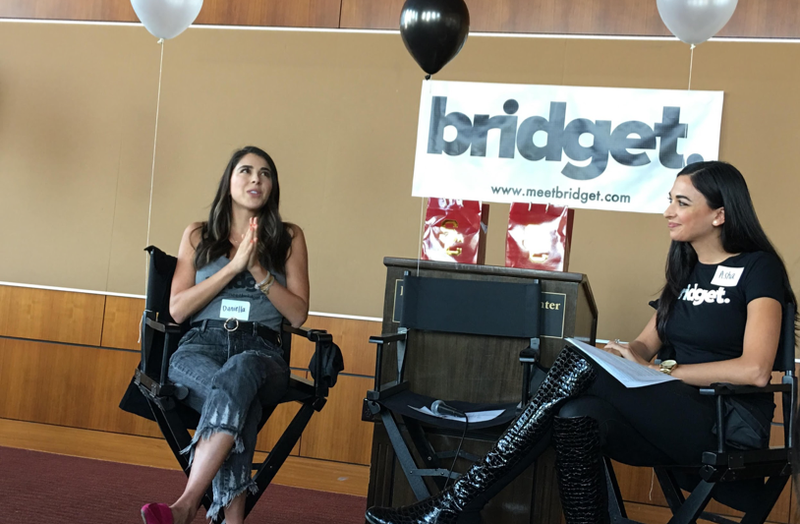 There was a Q&A with actress/entrepreneur Daniella Monet. I read my original poem, “Unraveled,” which was published earlier this year in the El Camino College literary magazine called Myriad. Another Bridget alum sang “Hallelujah” by Jeff Buckley. Artist/singer/musician Connie Lim held a mini-concert at the event, singing her hit single “I Can’t Keep Quiet” along with all the girls. There’s something unifying about singing along to a song about struggle and empowerment with a room full of strangers. However different we may be, there is a plethora of common experiences that we share with everyone around us. We can use those common experiences to form meaningful connections with those around us. Bridget takes advantage of this by giving motivated young women a way to build a strong network of peers, teachers, and mentors. OVERVIEW: Bridget is an empowerment organization that uses intimate skill-development and video production to connect teen girls to a spectrum of professional women. MISSION: To increase advancement transparency and diverse visibility of women, Bridget engages teen girls in dynamic co-creation of a video library that will shed light on real women and real career paths. If she can see it, she can be it. 1. Radically transparent, quick video interviews of professional women, about their personalities and career paths. 2. Video features of Bridget program teen girls, who learn to confidently state their interests and ask honest questions. And follow @meetbridget on Instagram.